Google Panda 3.9 for Japan and Korea updated on 19th July 2012 and Google Panda 3.8 updated on 25th June 2012 and for month of July 2012 Google Panda 3.9 full version updated on 24th July 2012. New data refresh of Panda starts rolling out tonight. ~1% of search results change enough to notice. 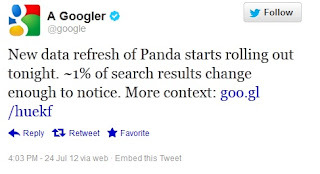 Do you affected by Google Panda 3.9 update? 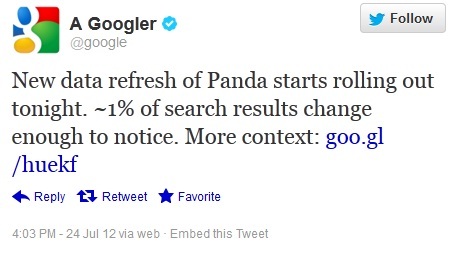 Now the question is that is your website affected by this Google Panda update. You can share your valuable comments here regarding Google Panda 3.9. Good thing that you have it refreshed. The viewers must have waited for the immediate solutions to arrive. And really that fresh air for everybody who have been expecting for it. Is it Bug in Google.com?